FFonts is a great new website that allows for the exploration of and download of fonts (for Free!) There are huge numbers of fonts on this site and they are organized in a logical manner with previews of each one as well. Teachers and students are sure to find the perfect typeface that will make their paper or presentation come to life with on this site. Users can even submit their own fonts. A wonderful resource for the modern day classroom. The fonts are being categorized in alphabetical order as well as type styles for easy navigation, I think this site is a cool alternative fonts resources sites besides dafont.com and many others like the two mentioned in the previous post. When comes to free fonts resources, dafont normally will be the first sites that comes to mind becasue of it’s great font library and easy to use interface. However, there are also other alternative font resources sites that showcases top quality free fonts in the world too, they are Font Squirrel and Fontex. Both sites tend to make the quality free font searching easier and present in clean and simple way. According the Font Squirrel “Free fonts have met their match. We know how hard it is to find quality freeware that is licensed for commercial work. We’ve done the hard work, hand-selecting these typefaces and presenting them in an easy-to-use format.” Indeed Font Squirrel site is clean and easy to use. The fonts are listed in a list format and categorized in style. It also previews the font and its family too. This is a free vector template for collar shirts. Well there are plenty of free templates for t-shirts available for download but I see less for collar or polo shirts, so I create one out and release it for download. Because it’s a vector file, you need to have vector software to use it for example Adobe Illustrator etc. Just grab the download link below, unzip it and start using it right away! Japanese certainly are expert in good looking and cute handwriting style fonts. So, since I wrote about this post a while back, I think it’s time to go hunt for more free Japanese fonts, and the finding was good. I found these 12 really nice handwriting style fonts that are free to use! Banzai! All these 12 Japanese handwriting fonts here are able to write in Hiragana, Katakana, Kanji, as well as Romaji characters and Numbers. There is one even can perform emoji too. So, the font files are quite huge. As usual, I will give you a screenshot of the fonts, as well as the link to the original page and a download link. Many of the fonts are zipped and some of them are zipped in .lzh format. I recommend to use WinRAR to extract it. Here we go. It’s free resource time! Well this is a button design resources with different styles and colors that created by myself. The button is make out of scalable shapes, so you can adjust or resize, it’s flexible and highly customizable. Feel free to download if you like it or find it useful. You can download the PSD resource file at link below. The file is hosted at Box.net and best is to work on it with Photoshop version CS2 and above, but I think CS version should be fine too. Well the buttons work great with darker background. By the way, to use this as web button, you can refer to this great tutorial about Make fancy button using CSS sliding door effect. The button design above are part of the sleek button designs at Useful Web Button PSD file. Please purchase it if you want to own one of them too. Check out my fresh GraphicRiver portfolio too 😀 . Update: Have you downloaded Firefox 3 today? Finally it’s here. Today is Firefox 3 Download Day, I’m just downloaded and currently using it and it’s pretty good! 😀 I’m very impressed on the numbers of the downloads, it’s already at 2.7 million, just 8 hours after I received the email notification from Mozilla. Well if you have not download it yet, please do it now in order to be part of the creation of Guinness World Record of most downloaded software in 24 hours! 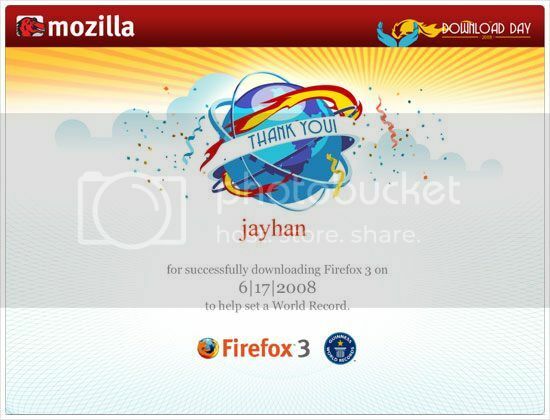 To make things even nicer, everyone who participated has the opportunity to own a “Thank You” certificate from Mozilla like below, as appreciation to help setting the world record. That was nice! Internet is interesting. Everyday we stumbled upon different websites, articles and stuff that caught our eyes. This “Links of Interest” series is a collection of website bookmarks that I found interesting and useful, and would like to share with you. Websites ranging from web designs, inspiration, resources and many others. Download the latest Artzmania e-zine issue. My friend’s work was featured in this issue too. Congratulations to him! 4U is social image bookmark service for everyone to share a beautiful woman image all over the world. Newspond is the ultimate hub for the latest tech, science, and gaming news. Sleek graphic interface. Design by Chan Karunamuni. On-line Nation Vs. Nation PC game [SPACE INVADERS WORLD WAR]. Beta version expected to be available on mid April! Create any size wall posters from any size images. Totally Free To Use! The Rasterbator creates huge, rasterized images from any picture. Upload an image, print the resulting multi-page pdf file and assemble the pages into extremely cool looking poster up to 20 meters in size. Turn your photo into Japanese ancient photo effect with this generator. Should Redesign? Cast your vote now! Launched in April 2008, a Suffolk Software project, Should Redesign aims to help webmaster determine if their websites need a refresh. Adobe TV is your online source for expert insight and inspiration. feed your passion for Adobe products with insider tips, innovative techniques, and behind-the-scenes tours delivered on video, on demand. People often think it is extremely difficult to make a website. That is not the case! Everyone can learn how to make a website. Use our tutorials on HTML and CSS and start building your own website in about an hour. The custom search engine that brings you to the best design resources on the web. Sometimes I am more anticipated to one movie’s title sequence than the actual movie. This site collects and showcase the great title sequence of movies and drama series that will make you watch twice. Amaztype using Amazon web services. Basically you just enter any typographic book related word (for example “typography” above) and it will shows up the results in the form of words you search just now. Founded in 2002, the owner Christopher Cox turn the initial portfolio site to a resource for the global creative community. The site has since continued to grow adding editors and content at an accelerated rate. James White works are colorful, complex and geometrical. A very unique style indeed. Like it. An inspiring blog and ranges of works by Scott Hansen. Scott’s works has vintage feel. It is very impressive seeing how this site grows. This blog was created and developed by Fabio Sasso, with a group of writers. This site has inspired me in many ways. Stupid Name. Cool Flash! Your one stop shop to download free flash files and tutorials. Basically this search engine helps you search image from many big image search engines like Yahoo! image search, Flicker etc simultaneously. Perfect. Takashi Murakami at the Brooklyn Museum. Takashi Murakami is one of my favorite Japanese illustrator. His work is cute and vibrant. Best known for making LV handbags colorful. Although I did not listen to Keane’s music, but the cover design deeply attracted me when I first saw on newspapers. Then, through several sources like internet and magazines, I knew who is the designer behind the cover. Listen to music online with this cool, user friendly web service. Aviary is a suite of web-based applications (RIAs) for people who create. From image editing to typography to music to 3D to video, we have a tool for artists of all genres. Just enter your email address if interested in the Early Bird Invitation. Jeans is my most favorite pants and I wear it almost everyday when going out because it is nice and very tough. The colors and textures or tactile are also very unique which will give different kinds of feels. Here I scanned some jeans to create free jeans texture to share with you all. Besides that, I also found some jeans texture out there which is good in quality and compiled them into a list, mainly sites from CG Textures, Deviant Art and Stock Exchange. Continue reading to check out the jeans textures! There are many cool and creative Japanese Katakana design fonts out there designed by various font designers. Here I compiled a list of 36 cool Katakana font resources which is free for download to add to your Japanese fonts list!